Attorney Jack Newlin comes home one evening to find his wife dead on the floor. Convinced that he knows who killed her, and determined to hide the truth, Jack decides to make it look as though he committed the felony. Before calling the police, he stages the crime, so that the evidence incriminates him. And to hammer the final nail in his own coffin, he hires Mary Di Nunzio, a reluctant rookie and the most inexperienced lawyer he can find, at a hot Philadelphia firm. However, hiring Mary is where Jack makes his mistake. She doubts his confession and starts to investigate the murder. Mary's ethics and instincts tell her she can't defend a man who wants only one thing, which is to convict himself. But because she is intelligent, strong-minded, and courageous, she decides to stick with the case and see it through to the final verdict. And nothing is ever certain until the final moment of truth. ©2000 Lisa Scottoline (P)2000 Recorded Books, Inc. This narrator is Barbara Rosenblat. She is extremely hard to listen to!! 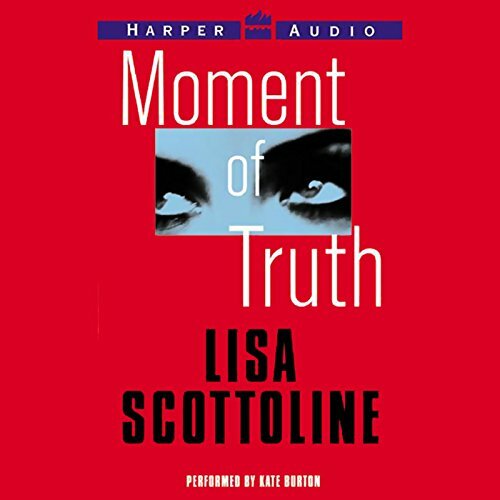 I love Lisa Scottoline novels but this narrator is terrible!!! Sounds like she’s eating and chewing and the swallowing noises are awful!! The breathing noises are worse! If you can get past all that lucky you! I couldn’t! Waste of a credit! I tried twice to listen to this book because I have enjoyed this series in the past but Kate Burton is a horrible reader! I’m abandoning the book all together. I have not placed a formal review in the past but the narration was so horrible I had to comment. The narrator sounds like she is eating and constantly makes wet sounds when she speaks. It is very distracting and gross! Not sure what was going on but I did not enjoy this narrator. The story was great but the narration was horrendous. Sounds like she is eating or drinking something the entire time. Almost made me stop listening. I love all of these books. Lisa Scottoline is a terrific story teller. I've listened to Kate on another book and like that she has different voices for each character. But in this book it sounded like Kate was eating or drinking while she was reading and it was very distracting. It was nearly impossible to concentrate on the story with the irritating swallowing sounds and lip smacking of the reader - sounds as if the narrator was snacking throughout the entire story - awful. Decent book I like the series. The narrator is ok, but it is extremely distracting to hear her breathing and swallowing. I did not like the reader. She sounds like a smoker and the way she tried to change characters by speeding up was terribly annoying. The story was just ok.
Storyline seemed fine but didn't get through it because the crackling/smacking/scratching noise in the background was unbearable. Good story but HORRIBLE performance!! This was a fine story and, overall, I enjoyed it BUT if you choose to listen to this book (I have listened to other stories read by this same individual and they were fine), throughout the ENTIRE book, she sounded as if she was talking with food in her mouth, having to swallow after every few words! !